Hey Seekerville! Larissa Reinhart here with giant mugfuls of steaming coffee and a tray of fresh cinnamon rolls oozing with cream cheese icing (because if we’re virtual I’m going for the extra calories.) I’m Debby Guisti’s friend and a humorous mystery writer. I’m also a Seekerville stalker (I read them in my inbox) and occasional poster. Today we’re talking mystery and suspense. And we’re getting personal. Very personal. Nor blood and gore personal. Because we don’t need any of that to make a good mystery. What we need is a very personal reason for our heroine/hero to solve this mystery. But, you may say, if my character is a detective/agent/law enforcement/soldier/superhero/nosy neighbor, isn’t their job or personality enough for solving a crime? Just because you have a mystery plotted, it’s not enough to keep the reader interested. 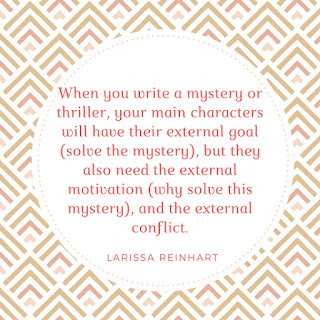 As in all other kinds of genre fiction, when you write a mystery or thriller, your main character will have their external goal (solve the mystery), but they also need the external motivation (why solve this mystery), and the external conflict. The personal reason to solve this case is the motivation. And if it’s just their job—snore. Nearly every detective and amateur sleuth faces threat to their life in a story. After all, the killer will want to stop them from solving the murder. That’s the conflict, not the motivation. How many of you would move to Cabot Cove where Jessica Fletcher lives? Not me. Fictional Cabot Cove is said to have the worst murder rate in the country. And although we may joke about “Cabot Cove Syndrome,” the reason that series is so popular is not that a small Maine town has countless deaths that need to be solved. 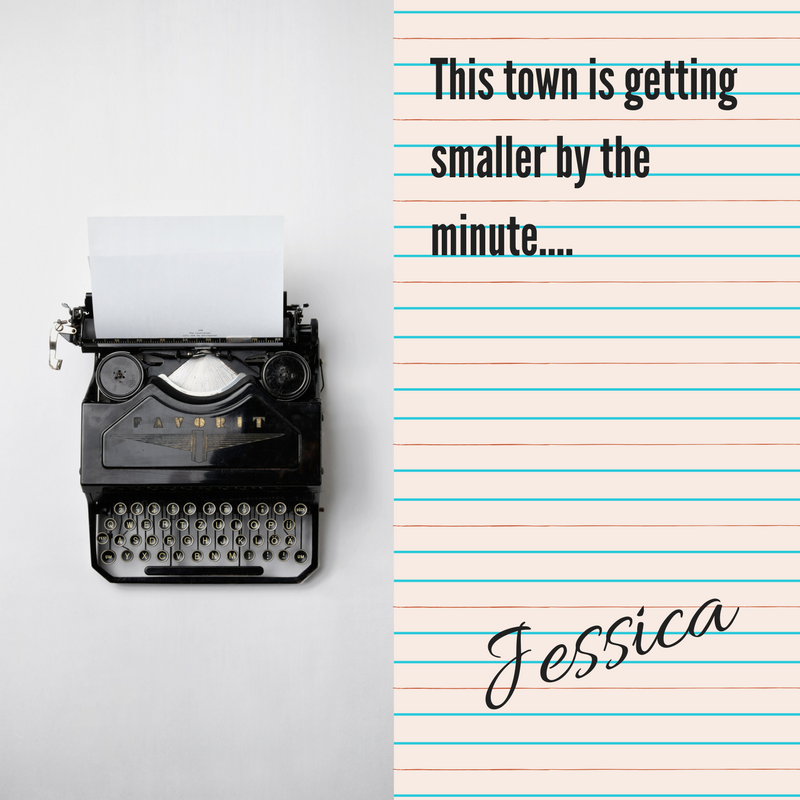 Jessica always had a personal reason to act as an amateur sleuth. Her friends are unjustly accused of crimes. Or her friends’ friends are murdered. Or disappears. It’s a small town. She knows a lot of people. You get the picture. She cares about her friend. Therefore, we care. 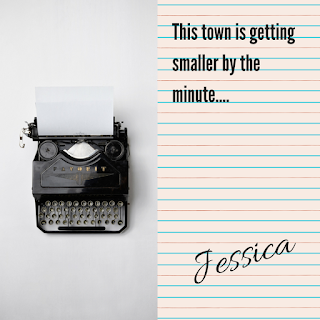 After all, Jessica’s a writer. She has no business getting involved in murder. And really, with all the crime in Cabot Cove, if Jessica had any sense, she’d lock herself in her house and never leave. But for a friend, she’ll face the killer to solve the crime. But isn’t the job of law enforcement to solve a crime? Bruce Willis was a New York cop in Die Hard, just visiting his wife in California during the holidays. We don’t know much about his work with the New York police, except that he’s the cowboy type, which helps when his wife’s company building is taken over by German terrorists during their Christmas party. And yeehaw, Bruce Willis has a reason to save the day. As estranged as the married couple’s been, it’s his wife’s building. He must save her. I don’t think he’d walk barefoot over glass to save a Japanese CEO (not in the Eighties, anyway). So it’s more than a job. What pushes your character to straddle the line of vigilantism? Sure, their backstory is full of motivation to have the personality-type to solve this crime, like Bruce Willis’s cowboy attitude in Die Hard. Something in their childhood has caused them to want to right wrongs. They have a personal sense of justice. That’s why they have this job or are a town busybody in the first place. That’s not enough for your reader. They need to care about the victim not just your character’s internal motivation. Lethal Weapon begins with Murtagh and Riggs investigating the apparent suicide of the daughter of Murtagh’s friend who might have gotten involved in drugs. A reason for Murtagh to take the case more personally, and therefore for the viewer to do the same. If your character is a detective/law enforcement/agent/soldier/superhero and the motivation begins with their job, then they need an immediate, real, dire threat to losing their job or better yet, their life, to motivate them. We don’t read about the cases that private eye Sam Spade takes to pay his electric bill. In The Maltese Falcon, his partner had been killed while on a case. Sam Spade’s been accused of killing his partner’s killer. And then there’s the dame. Sam knows he shouldn’t help her, she could very well be the killer. But he can’t help the attraction. We know Sam shouldn’t help her, yet we want Sam to help her. We’re sucked in. How can you make your sleuth personally motivated to solve a crime? Even if it’s not an old friend who needs help, you need to make them personally attached to someone involved. Sam Spade had his partner’s death, but he also had his attraction to Miss Wonderly/Brigid O’Shaughnessy. My Cherry Tucker series has a bit of Cabot Cove Syndrome in Cherry’s small-town of Halo. In my newest series, Maizie Albright Star Detective, Maizie’s just moved back to her hometown. Unlike Cherry Tucker in Halo, Maizie’s an outsider, an ex-teen star who’s been kicked out of Hollywood. 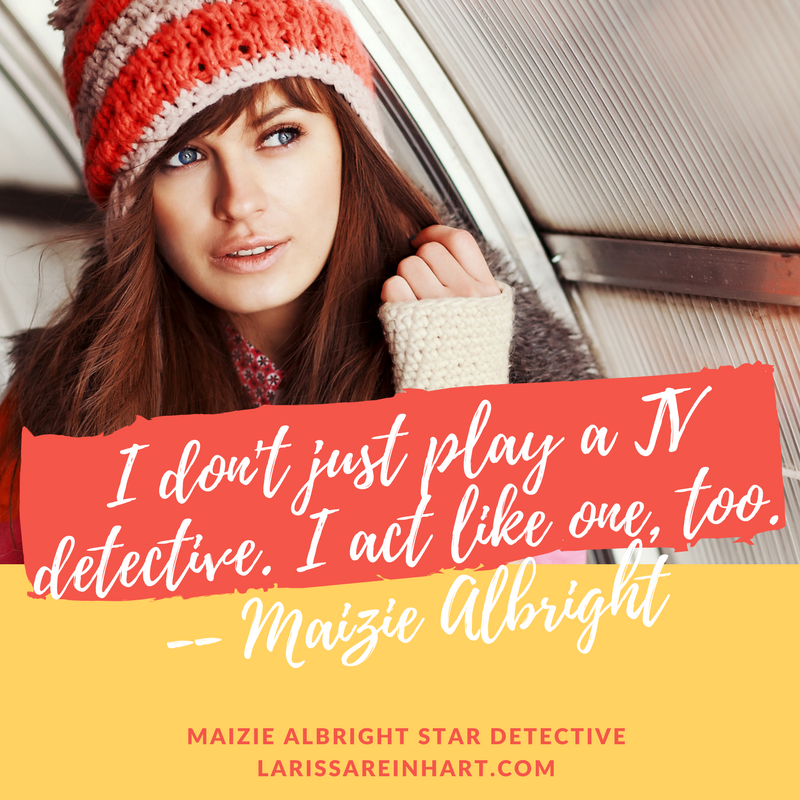 Maizie loved playing the role of Julia Pinkerton: Teen Detective and found the family she needed while playing that role. That’s the internal motivation for her to become a private investigator. But that’s not enough to make the reader care about the case. How can I make these cases personal when she doesn’t know anybody but her father? 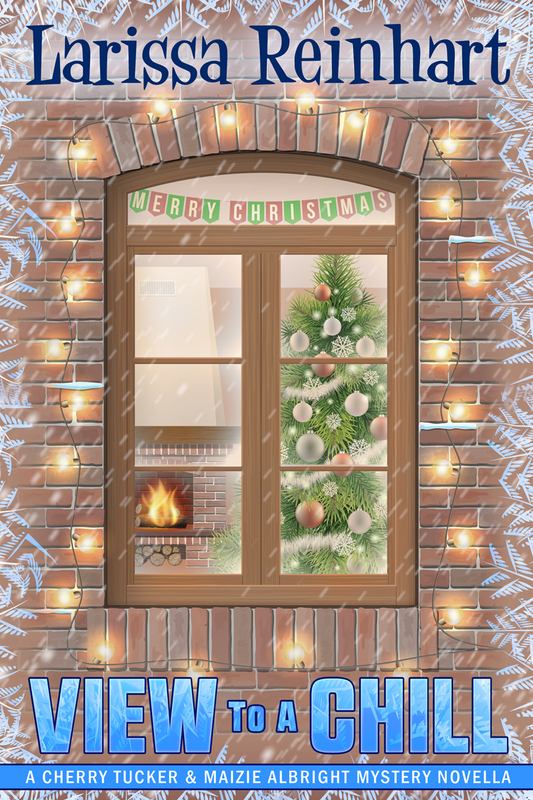 Leave a comment to win an ebook of my newly released Cherry Tucker/Maizie Albright Christmas Mystery novella, A VIEW TO A CHILL. Just say hey but if anyone’s interested in writing mysteries/suspense/thrillers, do let me know! How have you created a personal reason for your protagonist to get involved in a case? How many of you are mystery fans? Do your favorite books have the personal motivation for the sleuth to solve the case? Thanks so much Seekerville for having me on today! 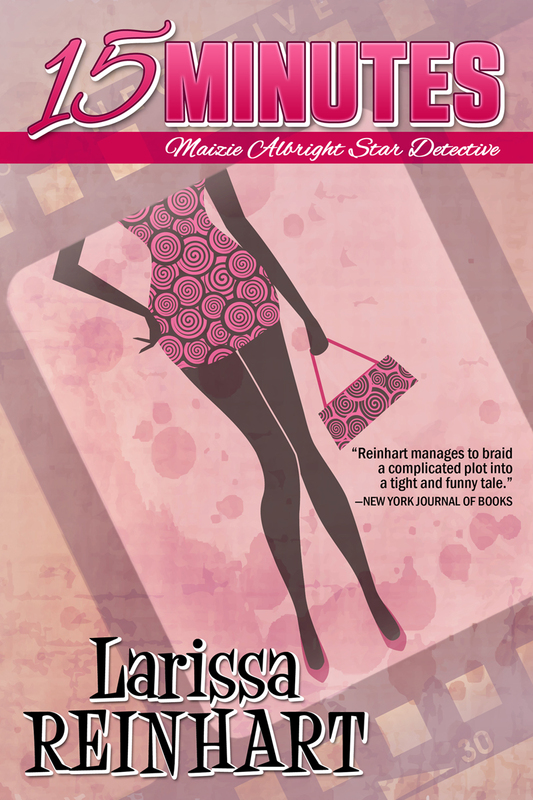 Larissa writes humorous mysteries and romantic comedies including the critically acclaimed Cherry Tucker Mystery and Maizie Albright Star Detective series. 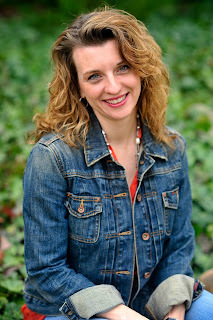 Larissa’s a The Wall Street Journal bestselling author, a contributor to the 2017 Silver Falchion Reader’s Choice winner, was the 2015 Georgia Author of the Year finalist, 2012 Daphne du Maurier finalist, 2012 The Emily finalist, and 2011 Dixie Kane Memorial winner. Larissa’s family and dog, Biscuit, had been living in Japan, but once again call Georgia home. See them on HGTV’s House Hunters International “Living for the Weekend in Nagoya” episode. 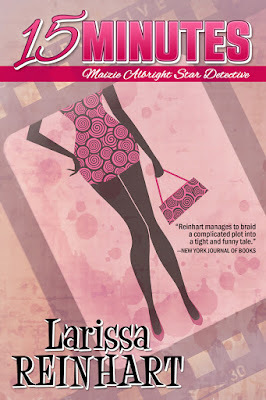 Visit her website, LarissaReinhart.com, and join her newsletter for a free short story. Debby here! Larissa writes mysteries that delight! She's delightful too! I'm so glad she can be with us on Seekerville today. If you would like to be entered in the drawing for Larissa's latest, View to a Chill, mention the drawing in your comment. For those who haven't read Larissa before, her stories are PG-13 and contain some adult topics. Hi Larissa, thanks for being on Seekerville. I love the amateur sleuth (those are actually two hard words to spell...amature...amature...sluthe...sleuth...) anyway, moving on...I love your explanation of how to motivate your amateur sleuth and by extension, your reader. You know what Mary, amateur sleuth is also hard to say. lol Thanks so much! Too many vowels! I'm glad we're not the only weird family that thinks Die Hard and Lethal Weapon are great movies... Because I totally root for the good guys!!!! Count me in on Die Hard and Lethal Weapon! And I watched Jessica Fletcher at times. Do you get the Hallmark mystery and suspense channel? I need to check it out! Hey Ruth! I think they need a John McClane ornament. Maybe a piece of broken glass or an elevator? Lol It's been a while since I've seen that movie. I love Lethal Weapon even more after reading James Scott Bell's books where he uses Murtagh handing back the bullet at the end of the movie. It made a greater impact on me reading that than it did when I watched, now that I understand story structure! I wish I got the Hallmark mystery channel, it'd be perfect for my daughter. She loves their movies! COFFEE IS ON, MY FRIENDS!!!! AND DANISH... No calorie counting today! Thanks for the coffee, Ruthy. I'm enjoying my first cup. Scrambled eggs, ham, bagels and biscuits, plus a bowl of fruit are also being served. Head to the breakfast bar and grab a plate! I heard a rumor that Hercule Poirot is sitting at a bistro table, sipping coffe, and reading one of Larissa's books! What a great post! I love mysteries and trying to figure things out before the ending. Thank you so much for sharing today. Yes, please include me in the giveaway of an e-copy of your book. I would love it. You're in the drawing, Cindy! Hey Cindy! Thanks so much for stopping in! The puzzle is the best part of a mystery! Welcome, Larissa! Your mysteries sound delightful! How on earth have I missed these??? Definitely going to check them out! Thank you for joining us today! Hey Glynna! Thanks so much! So glad to be here. I love Seekerville. Snow in GA! An inch to inch and a half in my area! School is cancelled! My teacher daughter is excited. So are my grandkids. Good day to spend on Seekerville! Larissa, thanks for lining this out for us. I would love love love to write a mystery, and this coming on the heels of Ruthy's post last week makes it seem doable. After all, it's just another level of plotting. I read a lot of c cozy-type mysteries and agree that sometimes it stretches credibility to have SO MANY MURDERS in SUCH A SMALL TOWN. But if everything else draws me in, I'm able to suspend disbelief. It's a snow day here too, Debby. Fortunately, I have no place to be but here. Good morning!!! Sorry I'm late! Debby, can you believe this snow?!!! I overslept, it was so dark and peaceful!! I went out on the deck last night when it started to snow. Remembered all the fun I had as a kid when it snowed. Love when it hits...and then leaves in a day or so! I do like it when it leaves! LOL But we're enjoying the day off. Great post! I'm still working on finding my genre, so for NaNoWriMo this past November I tried writing a more suspenseful type of story. Turns out after 50K words I still have no real plot, very little motivation, and only a bit of conflict. It sure was fun to write, though. I'll be using this post to help do my self-editing/hatchet job on my WIP and see if I can ramp up the suspense and romance and make something of this piece. All hope is not lost :) Thanks for being here! Thanks Glynis! You have to start somewhere and with words on the page, you can start shaping the story. I love James Scott Bell's signposts for making sure my story is on track. It sounds like you were working out your characters and their backstory? That's a good jumping off point. When you figure out the conflict to move the plot along, other things should fall in place. Good luck! What genre do you read, Glynis? I love suspense...love to read it and write it. Writing what we enjoy reading is a good rule of thumb when trying to find our genre. Hi. Love to read mystery! Do you know who the "bad" guy is at the beginning or does it evolve as you write? Hey Rhonda! Great question! I'm more of a "pantser" than "plotter," but I always have the original crime worked out even if the bad guy might change. So I think "means, motive, and opportunity" and come up with a list where that fits several people (because you need more than one suspect). Then as the story develops, I start to get a feel for the greater motivation for the baddie. Sometimes I know from the beginning, but sometimes as the story progresses I'll have an epiphany about why it should be this suspect X. As I'm writing, I'm realizing more about the victim than I initially did and that means I'm learning more about the perp. I find it's easier to create twists in the story that way, too. Does that make sense? Great idea, Larissa, to make a list of possible bad guys! Thanks for the tip! I didn't ask the question, but your answer makes me feel better. I thought X was the killer, but as I started my story, it made more sense that Y was the bad guy. Acutally, Ruthy's post about writing the end and working backwards helped me come to this decision. Great! I discover more while I'm writing than in planning, but that's just me. Hope it works for you, too! In 2017, I toyed with the idea of writing a mystery. I did my homework and discovered series are important. So, I began creating my setting and characters. Your post today is definitely going into my 'keeper' notes. Thanks so much! I'd also like to be included in the drawing. Thanks for that too! Awesome! Yes, series are very important. There are so great standalones that do well, but particularly for new writers, you generally are going to need a series. For mysteries, anyway. Thrillers are a little different, but series work well for them, too. Thanks you all! I hope you stay safe in GA. No snow here yet, but they're predicting tonight. You're in the drawing, Marilyn! Reshaping, revisions, rewrites...they all make the story better! Good for you! Hi Larissa. What a fun post. I have never written a mystery, but I sure would like to some day. I admire you folks that do. I'm not much of a plotter and that would be a necessity for a mystery. I'd love to read your book! Hi Cindy, check out Larissa's comment above. She's more of a pantser! Really! Hey Cindy! I'm not much of a plotter either, no worries! I work a lot more on character development than I do plot because that comes to me as I write. And I write linearly. A causes B causes C, so each scene is more reactionary than anything else. But I have to get that inciting incident in the beginning worked out as a jumping off point. And that incident is because of the original crime. The original crime is pretty much backstory. So I do my backstory stuff with the characters & original crime, then I begin writing. I hope that helps! Hey Larissa! Mystery/suspense is my favorite genre. I enjoy a good page turner that I can't put down! I brought hot chocolate and French Toast to share. French toast sounds yummy, Caryl. We're in the teens in GA today. Too cold! Hot chocolate sounds wonderful! With marshmallows, please! I need that hot chocolate! It is way too cold for Georgia and with all this snow, I'm having trouble keeping warm! lol Thanks for stopping in, Caryl! 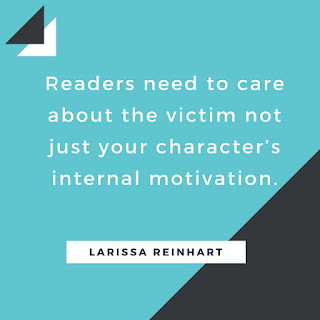 It's so true about the reader needing to care about the victim. Strong motivation. The really great books/movies weave it so seamlessly it seems simple. Of course, we'll never know how many times the author may've beat their head against a brick wall until she got it figured out. I think the authors are banging their heads against walls, desks, computers quite a bit. That comes with the job. lol It's amazing how many great suspense stories have victims who are personally connected to the protagonist. And we never think twice about it while reading it. The only exceptions are when the mystery is so intricately created -- I'm thinking Sherlock Holmes -- that we just want to solve the puzzle. But I was not much of a Sherlock Holmes fan, more because I didn't really like Sherlock (the book, not the movies), so maybe if he had a victim he cared about, it would have stuck with me more. I'll have to think about that one! I want emotion in the stories I read, which is what you both are saying. We have to care about those characters! This was such a good post. I am all about the cinnamon rolls, too! I don't usually read mysteries, but yours sound wonderful. These are all such great tips, Larissa, thank you! We love the tv series Lethal Weapon as well and I think the actor who plays Riggs is even better than Mel Finson was in the movies. Figuring out that personal connection can take some brainstorming but the fun of writing a mystery or suspense is figuring out your puzzle. Please put me in the draw for your ebook! Hey Laurie! I haven't seen the tv series. I'll have to look for that one. The puzzle is the key to why people seek out mysteries, for sure! That's why I like paperbacks...so I can flip back and forth to ensure I picked up on all the clues. My Kindle doesn't allow me as much flexibility. Good morning Larissa and Debby! Thanks for a terrific post, Larissa. I'll certainly keep this tucked inside of my Seekerville notebook for future reference. Hi Larissa, it's great to see you here in Seekerville. Yes, I have been a mystery lover since I read my first Trixie Belden book. I recently read Fifteen Minutes and loved it. Thanks for a chance to win your new book! I love Larissa's voice and stories. Glad you enjoyed Fifteen Minutes! Nancy Drew was my favorite series growing up. Still love those books. Hey Connie! You're so sweet! Thank you! I'm so glad you liked 15 Minutes. And I'm so glad to be here. I get Seekerville in my inbox daily! Larissa, what a great post. I do not write mysteries, but I enjoy reading them. It seems like having a personal motivation would be important in other genres too. If my character has a personal reason for going on the journey of their story, I have more options for upping the stakes and creating tension, Yoiu've got me thinking about my story now. Laughing at not wanting readers to think! We really want them turning pages and completely into the story! :) I call it Total Immersion. That's what happens when I'm writing a story and am totally there...in that Amish home, cooking on a wood stove and calling the kids in from chores to eat breakfast. At least, that's the current scene I'm working on. UM, Blogger ate my comment again. Just sayin'. Mean blogger! Boo! I'm having trouble today. I think my computer is too cold! Brrrr! I mean it wasn't anything deep or anything, but one does like to stay engaged with one's peers. Any idea why it keeps doing that? If anybody GETS this, please enter me in the drawing. Now I always copy my comment before I publish it. That way if it gets lost in cyber space, it isn't lost forever. I just paste it and try again. And you DID get through! But I had followed my own advice, and had copied the one to Larissa. This one? I'm going to copy it this time!!! KB, are you using CHROME? I get better results with that search engine. Ah..CROME is a search engine, right? Hi, Larissa and welcome to Seekerville. You'll have to excuse me while I wipe a dollop of cream cheese frosting from my mouth. But I do love me some cinnamon rolls. You know, I've never been a huge mystery fan, but I have to say that I'm very intrigued by your stories. Guess I just need to go check one out. Thanks, Larissa. Mindy, did you bake cinnamon rolls? Did you bake enough to share? Thanks Mindy! And glad you liked the cinnamon rolls! Larissa, shame on me! YOU made the cinnamon rolls! I didn't re-read the post this AM, but still, I should have remembered. Hi Larissa, and welcome to Seekerville! The main reason why I'd like to write a mystery is because I love reading them. I love the puzzles and engaging with the writer in the back and forth of figuring out the mystery. I'm printing off your blog post and putting it in my file! Thinking of an Amish mystery series, Jan? Hey Jan! I hope this helps. And loving to read them is your first step in writing them! Debby, that's what my husband suggested. I'm really not sure...I have a couple big projects to finish between now and then! Jan, I can see it! A sweet Amish sleuth. Lots of problems in the community and she solves them all. I don't know about you, Jan, but I'm always thinking about the NEXT book or one down the road while I'm writing the current one. I wish I could focus on one at a time, but that's how my mind works. That being said, be sure to write down your ideas as they come to you. They will! It's great to be busy, Jan, and it's great to have some ideas stored up for the future! Hi Larissa! I love the humor in cozies and was addicted to Murder She Wrote. Your books sound delightful! Motivation is so important in any story, but when the protagonist is willing to risk her or his life, the motivation better be believable. Thanks for the cinnamon rolls and coffee! A woman will be anything to save a child...or a kitten. Right, Janet? I need to add a kitten to my WIP. :) I did have a mouser in another story. Both my grand dogs have appeared in my stories. So fun for the grandkids! She’s a new author to me. Would love to be entered into the drawing for her book! Thanks! Thanks for stopping in, MH! Welcome to Seekerville, MH! Tell us a little something about yourself! I hope you're in a warm part of the country. Wait, is anyplace warm? I don't think so! 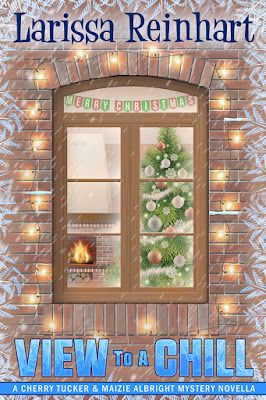 Hi Larissa and Debby, Ooh, what a great post. I love cozy mysteries, but I too would never want to visit Cabot Cove! But cozy mysteries always provide justice and order at the end, which is probably one reason I love them so much. And I agree there does need to be a strong motivator. I still regret not attending yours and Debby's program at Moonlight and Magnolias a couple of years back as romantic suspense and cozy mysteries are selling well. Hope you both are staying warm. It's a snow day where I am. BTW, I've read the first three Cherry Tucker mysteries, and I love the goat! Hi Tanya, our amazing GRW President!!! Congrats and thanks so much for serving! I had fun presenting with Larissa. Leslie Tentler was with us, if it's the program I'm thinking of. We knocked'em dead! LOL at the pun. Sorry. Blaming it on being housebound and cold! Hey Tanya! Thanks so much! We've got snow down on this end of Atlanta, too! Yes, Debby, Leslie Tentler, and I had a good time. Would love to do it again sometime. I need to get back up to GWA now that I'm back in the country! Thanks so much for stopping in! Larissa! So nice to see you here in Seekerville! I love authors who really make me care because their protagonist cares! Great illustrations! I love a small-town mystery, and Cherry Tucker and Maisie Albright sound like great characters! Waving to Erica! Larissa may have been raised in a small town, but she lived in Japan for a number of years, two different times, which makes her a world traveler. Check out the House Hunters episode she and her family were on! So fun to watch! Thanks so much, Phyllis! God bless you, too. :) They are fun to read. Contact me anytime if you have questions about writing one. Hi Phyllis! Hope you're staying warm today! I'm huddled under an electric throw and am sipping hot tea. I would love to be entered in the drawing. this was very helpful to me as a writer. Suspense is becoming one of my favorite genre to read. My Dad had surgery today. He has been pretty sick for the last week. I would appreciate prayers for his recovery. I hope all those enjoying a snow day are doing well with this winter weather. Wilani, sending up sweet prayers for your dad! And wasn't this post wonderful???? I'm so sorry about your dad, Wilani. I'll be praying for you all. Hi Wilani, I'll definitely include your dad in my prayers. I hope he heals and the surgery does what it's supposed to do. Good luck with your suspense writing! Wilani, I'm praying for your dad! And for your peace of mind. Keep us posted! I like to read suspense/thriller/mystery but I don't write them. However I think these tips could be used for any high stakes story. So true, Nicki. 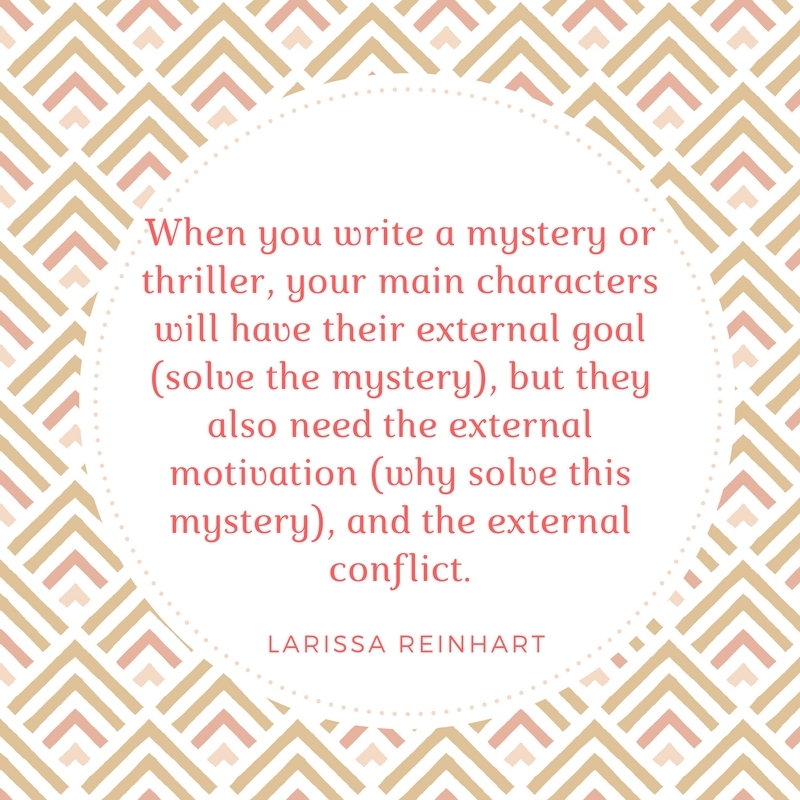 Larissa has provided great tips that apply to all stories...and especially the mystery/suspense genre, which I love to read! Larissa, thanks so much for being with us today. I'm sure we'll have some late-at-night comments, but wanted you know how much we enjoyed your blog post and all your wonderful suggestions about writing--and reading--mysteries! On this cold January day, you've warmed us up and gotten us excited about the who-done-its! Thank you!!! Keep writing so we can keep reading your wonderful stories! Thanks, Larissa. You may be hearing from me. Larissa, I don't wait until the following day to read my dose of Seekerville, but I often get here really late at night unfortunately. Looks like it was a great day! Larissa, definitely throw my name in the hat for the ebook! Your post is just what I needed today. I write suspense and I've been wondering if I have the ability to write a cozy mystery. I'm just in the mulling it over in my mind phase so I've got nothing when it comes to answering your questions. But I'm sure they'll help me out if I pursue a mystery. Great post! I'd love to enter the drawing for your book. Larissa thank you for the great article. You explained somethings that should be odvious but aren’t always. Thanks for your books too. They are very enjoyable reads that never let me down! Sorry I'm late reading your post. I'm an inveterate fan of cozy mysteries and have toyed with the idea of writing one. Your post was so enlightening! Please put my name in the drawing (unless it's already closed). Wow, that book sounds really fun, Larissa! Great job upping the stakes! And a great reminder for me to do the same! In the book I'm working on now, I'm not sure how personal I've made the stakes. My heroine is having to pretend to be a male soldier to save her mother's house. (It's a Mulan retelling.) She's attracted to the hero from the moment she sees him, but she keeps messing up and making him angry. There's a battle and they bond. And . . . I'm a little bit stuck there. How could I increase the stakes? At some point he'll realize she's a girl and be horrified at how he treated her in the beginning. He'll want to protect her, which puts him in an awkward and even dangerous position. But what would make him even more tense and conflicted? Not sure. Oh! Maybe he thinks she's a spy from the enemy! Sent to cause problems! Or . . . maybe he's angry that she did something so "foolish." Maybe he's worried that something bad will happen to her, just like something that happened in his past, and the worry disguises itself as anger. This is such a great post! I'm writing a YA cozy, and my crit group has been nudging me to answer this question. So I finally came up with an answer, but I didn't really grasp the point of the question until you broke it down here. Thanks so much! Enter me for the drawing if I'm not too late! Hi Elizabeth, so glad Larissa's post helped you with your writing! You're in the drawing! What a great post! Thanks for sharing Larissa. I love cozy mysteries. I would love to write one some day, but it is one of those long, long, long range goals. Thank you for sharing. Kelly, I hope your mystery goal comes to fruition some day!